A naughty pig escaped from a van on Scotland’s busiest motorway during the morning rush hour. 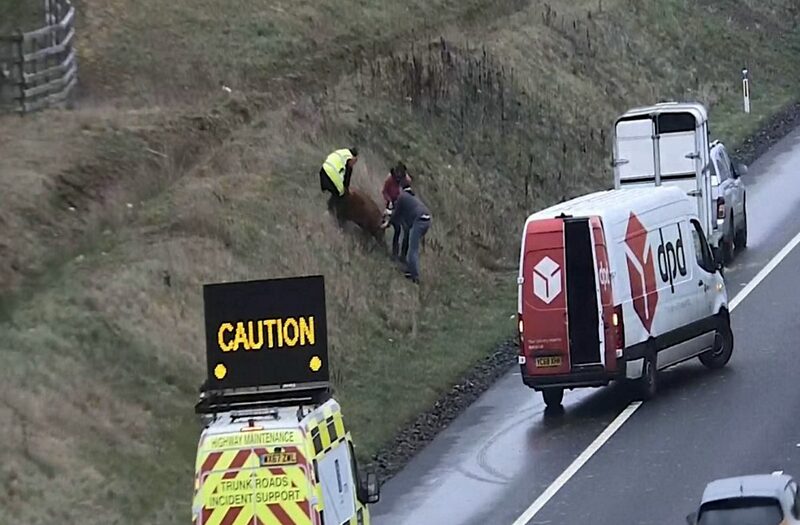 The huge brown hog was spotted on the M8 east bound at J8 Baillieston and J7a Shawhead outside Glasgow around 9.40am. CCTV footage showed the pig on a grassy verge, with three people trying to coax it back to a trailer parked on the hard shoulder. A maintenance van with an electronic sign warning ‘Caution’ was on the hard shoulder to alert motorists, and a DPD courier van could also be seen partly blocking the first lane. A tweet from Traffic Scotland read: “I’m not telling porkies, there’s a pig at the side of the road #M8 E/B J8 Baillieston – J7a Shawhead. Van partially in lane 1”. Luckily for the pesky porker, it was safely returned to the trailer around 20 minutes later.